Aboard a spaceship deep in outer space, something is alive, something is deadly... that something is...Alien. ALIEN has been described as less a science-fiction horror film and more a haunted house movie in which the spacecraft takes the place of the traditional house. Directed by Ridley Scott, the film owes much to past monster on the loose pictures such as It!, The Terror From Beyond Space and The Thing. H.R. Giger's design of the alien was a nice departure from the usual model (big head and eyes) used so often previously...and the film won an Academy Award for it's visual effects. Sigourney Weaver is superb in a star-making performance as Ripley, a role originally written for a man. The score was composed by the great Jerry Goldsmith. The setting is a huge mineral tanker spacecraft called Nostromo. Having successfully completed their mission, the seven members of the crew are returning to Earth and are sleeping in their isolation chambers. Soon however, they receive an S.O.S signal from a nearby planet - which they are required to respond to. Three members of the crew, Captain Dallas (Tom Skerritt), Kane (John Hurt) and Lambert (Veronica Cartwright), visit the planet in a small craft. They discover the remains of an alien civilization. Kane is investigating a cavern containing giant eggs...when one of them suddenly opens and a creature leaps out and envelopes itself to his helmut. He is taken back to the ship - where officer Ash (Ian Holm) places him in quarantine. 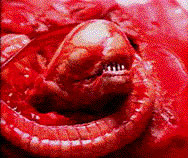 Kane's helmet is removed, revealing that the creature is now attached to his face...and an x-ray shows that a fluid has been deposited into his stomach. Kane is revived when the creature suddenly disappears. 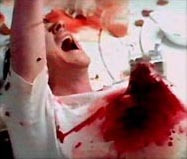 While enjoying his first meal after the incident, Kane dies horribly when a small alien planted by the other creature bursts through his chest. It scurries of - and the crew - including Ripley (Sigourney Weaver) band together to find it. During the search, Brett (Harry Dean Stanton) is killed while trying to retrieve his cat...and Captain Dallas dies soon after. The alien has grown immensely in size and is an even greater threat. 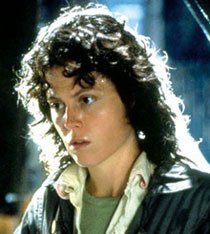 Ripley is now in command of the ship and finds out from "Mother" (the ship computer) that the reason for their mission was to collect one of the aliens for the company. She confronts Ash with this information and he attacks her. Officer Parker (Yaphet Kotto) comes to her rescue and bludgeons him...whereby they learn that Ash is actually a robot sent to secure the alien's return. Lambert and Parker are soon killed trying to escape in the shuttle craft. Ripley is the sole survivor and she takes off in the shuttle, setting the Nostromo to explode. The alien has managed to get onboard...but using her wits, Ripley utilizes one of the shuttle's jets to blast the creature into space. ALIEN was filmed at Bray Studios in England, the location where Hammer films were produced. The movie really functions on the level of claustrophobia. The thought of being in outer space, chased by an alien that is picking off your comrades one by one, is genius. Agatha Christie would be proud. ALIEN took many by surprise and was a sensation due in no small part to Ridley Scott, who had previously directed commercials. His work on this, his second feature, is tremendous. The suspense he created and the results he got from the cast are outstanding. In fact, some scenes appear to be improvised. Robert Altman couldn't have done it any better. Former child star Veronica Cartwright is wonderful. A study in nervous hysteria. Cartwright had proved her chops in the terrific remake of Invasion of the Body Snatchers the previous year. And Sigourney Weaver? A formidable presence...there had never quite been a protagonist like Ripley. It was an indelible characterization, a heroine for the ages. The actress went on to have a prolific career that has spanned nearly four decades, including three Academy Award nominations (one for the sequel ALIENS in 1986), as well as a starring role in the blockbuster Avatar (2010).